OK, so now you know I like Patron…Silver, that is. It took a long time and a few parties and get-togethers to get through this bottle. Initially I didn’t intend on keeping it. After I finished it, however I couldn’t part ways because I love the shape, color, and durability of it. 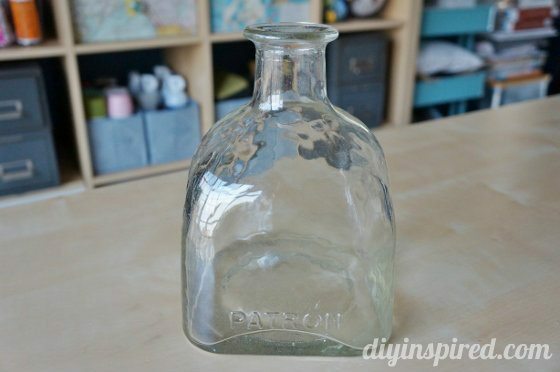 Instead of throwing it away, I made a recycled Patron bottle vase. The pictures speak for themselves; however I wanted to write out the tutorial. 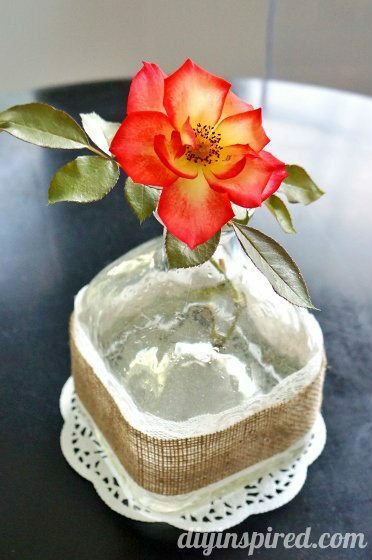 It’s a fun and SUPER easy project you can do in minutes with any type of bottle or vase. I did a guest post for Jill over at Popsicle Blog and she gave me some great materials to use. 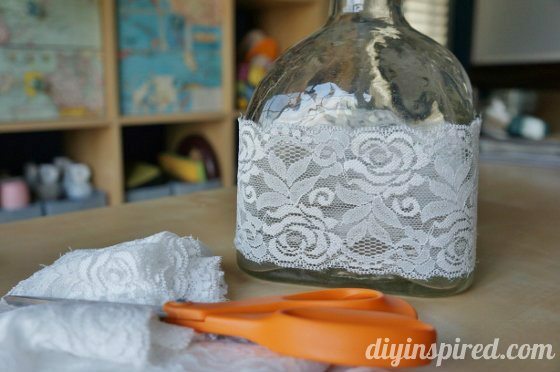 I used a thick lace ribbon first and wrapped it around, securing it with glue. 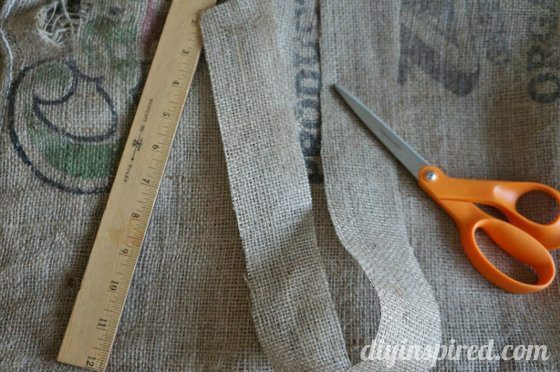 Next I found an old coffee bean sack that I used to make outdoor coffee sack pillows with a few months ago. I measured and cute accordingly. 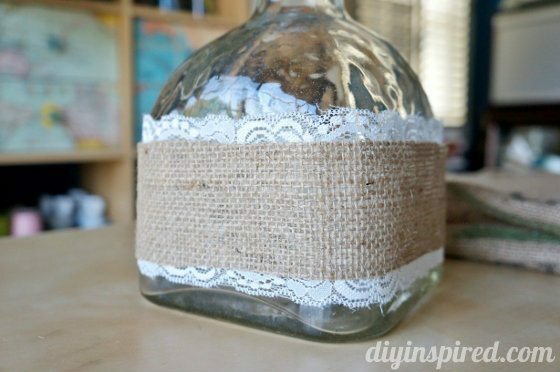 I secured it over the lace ribbon with glue. That’s it! Here is another AFTER photo. The possibilities of decorating a bottle are limitless. You can use all different textured, patterned, and colored ribbon to match your home or party décor. 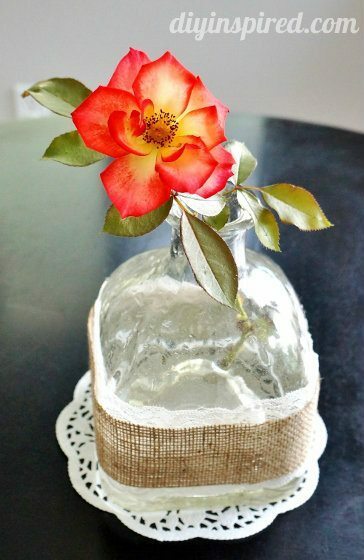 This is an easy and inexpensive way to recycle bottles and use them for wedding or bridal shower centerpieces as well. Group or cluster a few together to make a whimsical tablescape. Super cute! Those liquor bottles are always so uniquely shaped that you don’t want to just throw/recycle them away.